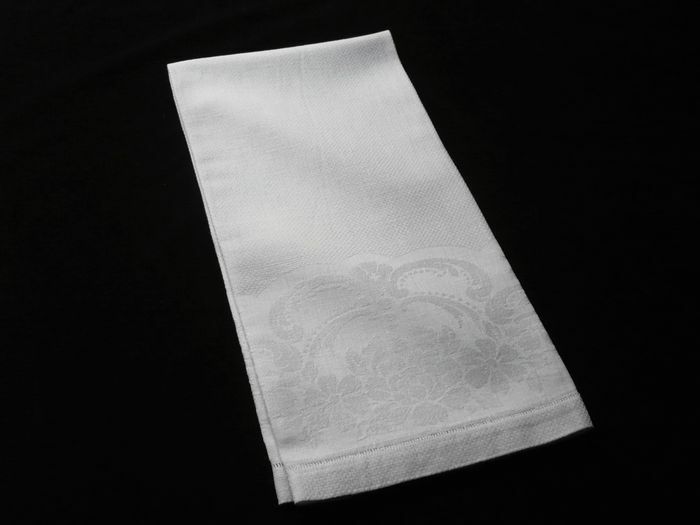 Three elegant guest hand towels loomed of a pure white and very fine linen/cotton blend. These pretty towels have an overall textured damask motif known as "oeil de perdrix," or eye of the partridge, as the tiny diamond pattern resembles birds' eyes. A border frieze of leaves and flowers decorates the edges with a more elaborate floral motif at either extremity. The hems are finished with a refined drawn thread hemstitch. This set of towels likely dates from the early to mid 20th century and is in impeccable condition. Dimensions: 33 x 24.5in.